South Manitou’s most impressive features are the perched dunes along its west side that rise more than 400 feet above Lake Michigan and the lighthouse, boathouses and other historic buildings of a former U.S. Lifesaving Station. Scattered inland are old farmhouses, barns, a schoolhouse and other remains of the island’s agricultural past while just offshore are several shipwrecks. 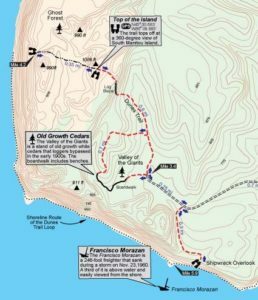 The 5,260-acres island is also laced with 17 miles of trails and primitive roads that provide day hikers and backpackers access to various historic sites and natural features, including a stand of old growth white cedars, as well as three walk-in campgrounds.